Published Oct 8, 2010 by Peachpit Press. Part of the Learn by Video series. This complete training program from Adobe Press and video2brain combines over 17 hours of exceptional video training with a full-color 120-page guide to teach you the fundamentals of Adobe Illustrator CS5 as well as the basic principles of vector-based graphics. Expert authors and trainers Chad Chelius and Russell Viers demystify the interface and show you how to create original artwork. You’ll learn to use essential tools to draw in perspective, set sophisticated type, work with multiple artboards, and create resolution-independent raster effects. The lessons are wrapped in a feature-rich interface that lets you jump to any topic and bookmark individual sections for later review. 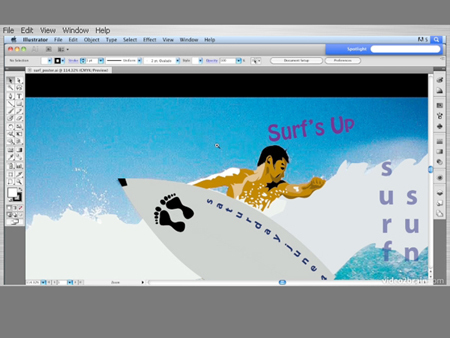 Full-Screen mode provides a hi-def, immersive experience, and Watch-and-Work mode shrinks the video into a small window so that you can play the videos alongside Adobe Illustrator CS5. As with all titles in the Learn by Video series, the project files used in the lessons are included with the course, and interactive review questions help reinforce what you're learned. Selected videos are also provided ready to be downloaded for viewing on your iPhone, iPod, or other compatible mobile device.